Train of Thought is an evolving community arts journey from west to east coast, with on-board activities and over 20 stops along the way. At each stop, a travelling company will get off until the next train comes through. 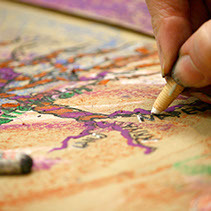 Local arts organizations will host interactive events, and add to creative tasks. Additional travellers will hop aboard to join in conversations and art-making en route. Train of Thought was hatched by a group of artists who wanted to share community engagement practices and projects. 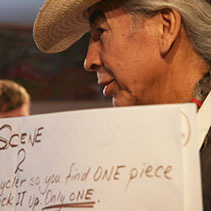 We asked ourselves what theme merited such a huge cross-country undertaking, a question that led to a focus on collaborations and alliances between First Nations and settler/immigrant artists and communities: the most challenging and urgent matter that all of us are grappling with and learning about, from our different regional and cultural perspectives. Train of Thought will ask many questions: What's not on the map? What other forms of mapping are there? How can we see the places where we live through new eyes? What protocols are there of arrival, gathering and departure for the territories we pass through? What place names can we learn and imagine? What stories are important to pass across the country? How can we grieve and celebrate together in the shadow of colonialism? How can community-engaged arts help us enter into these questions? 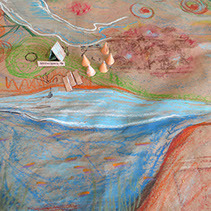 Train of Thought takes a counter-colonial route to collect and share stories, buried histories and imagined landscapes of the land where we live: as it might have been, as it is, as it could be: drawing on perception, memory, history and imagination; merging whimsy and serious intent, bringing together artists and community members, the land’s first people and all those who have found refuge here over the years and generations. Train of Thought is less about trains than about the relationships and discoveries that the journey will enable. When the train can't take us where we want to go, we'll defect for a while to buses and cars, and rejoin the VIA train route when we can. Train of Thought is an imperfect and incomplete adventure - part of a longer and unending imperative to learn, connect and help to change tracks. Train of Thought is produced by Toronto's Jumblies Theatre with partners all across Canada. You can learn more about them all by exploring this website as it grows and develops. Our Spring 2015 Train of Thought trip, linking places and people in a month-long creative and discursive adventure, which will strive to be the best it can be, artistically and socially, and we hope it will incite many other Trains of Thought. 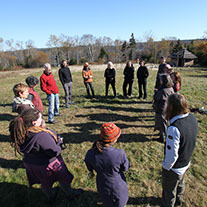 The desire to connect community arts practice across the country began with a group of community play producers (including Vancouver Moving Theatre's Terry Hunter and Savannah Walling; Runaway Moon's Cathy Stubington; Rachael Van Fossen, founder of Common Weal Community Arts; Dale Hamilton of Everybody's Theatre Company; Ted Little of Concordia University's Theatre and Development Program, and jil weaving of the Vancouver Parks Board). 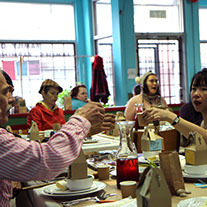 About 10 years ago, they started an ongoing conversation, with periodic visits and a series of Canadian Community Play Symposia, held in various locations to coincide with large-scale collaborative community plays. Ruth and Ted came up with the current Train of Thought notion on one such occasion: driving from Vancouver to Enderby in 2004. Even earlier, Dale Hamilton had imagined a community play project on the cross-country train, but was unable to pursue the project. The idea percolated and the conversation evolved and expanded over the years to include other national colleagues, arts disciplines and traditions. Finally, to bring the idea to fruition, Jumblies designed a multi-year scheme for national community arts development, with Train of Thought as a culminating event. In 2012, Jumblies was fortunate to receive funding for their National/Ontario Artfare initiative from The J.W. McConnell Family Foundation, the Ontario Trillium Foundation and the Canada Council for the Arts, as well as a VIA Rail sponsorship towards some train fares. Jumblies has, as a result, spent the past two years delivering collaborative workshops across Ontario and Canada, and the Train of Thought route, relationships and themes for the trip, have emerged from this process. 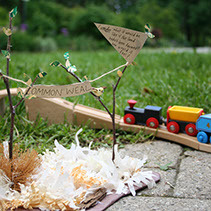 All of the hosts for the Train of Thought stops have been partners and participants in Jumblies cross-country workshops. Through these workshops, portable arts activities have been invented and tested and the theme of community arts collaborations between First Nations and other (settler and immigrant) cultures has come to the forefront. Our route is, therefore, idiosyncratic and uneven – only crossing Southern Canada, spending most time in Ontario and missing many wonderful places along the way. Our shifting travelling troupe is limited by funds, time and space on trains. In true community arts spirit, our desire to include everyone is sincere and impossible. In true theatre spirit, the time is approaching and the show must go on. © All images and words copyright and property of Jumblies Theatre, 2014. Photographs by Liam Coo, Katherine Fleitas, and many others. Web Design by Liam Coo.